Data clean up in the WAVE is the first step in preparing your district for a successful completion of the roster verification process. 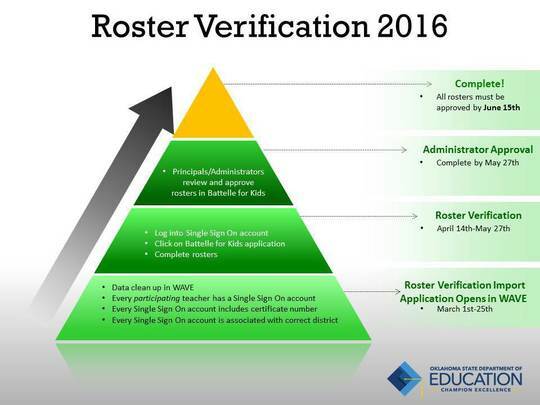 From March 1st-25th, district leaders will need to ensure teachers who will participate in roster verification are accurately accounted for in the system. This includes verifying that every participating teacher has a Single Sign-On account and that each account includes a teaching certificate number and is associated with the correct district. For those of you who have participated in roster verification last year, the process will be the same. If you need a refresher or if you are new to roster verification and need a tutorial, visit our TLE website. Several new bills focusing specifically on the TLE process are currently being heard by the Oklahoma Senate and House of Representatives during this legislative session. With the passage of ESSA, the role of deciding how teacher evaluation should function has been passed from the federal level to the state level. In response to this change, Oklahoma legislators are proposing a variety of suggestions that would shift the current direction of TLE implementation. As a result of recent and possible future changes, the 2016-17 school year will be used for informing and training of any changes including recent quantitative measures approved by the State Board of Education. Some districts may participate in pilot programs with the intention of simplifying implementation process for the rest of the state. During the 2016-17 school year, all districts will still be responsible for the same aspects of the TLE process that are expected for the 2015-16 school year. The goal is not to rush implementation or cause confusion during the next school year. Rather we will use this time to train and prepare for full implementation, as originally planned, for the 2017-18 school year. If you would like more information about current legislation, visit the Oklahoma Legislature website. In an effort to maintain consistency with our TLE reporting procedures, the deadline for final submission of roster verification and TLE qualitative data reporting on teachers and administrators will stay the same as last year. All reports will be due on JUNE 15, 2016. The Office of Educator Effectiveness is actively soliciting feedback to improve our evaluation system. The State Department of Education serves all educators and values ideas and suggestions geared toward improving learning and strengthening teachers. If you have any questions/suggestions regarding teacher evaluation or would like to schedule a training, you can reach us using the contact information below.